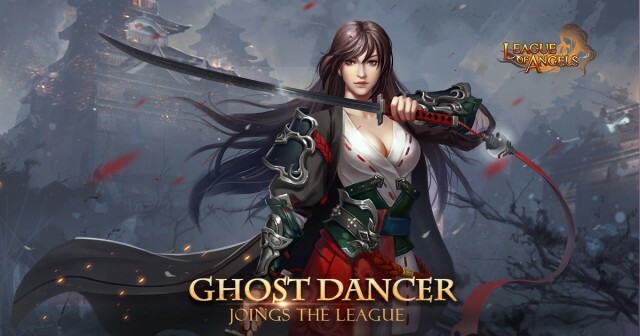 New Hero Ghost Dancer Shows Up In League Of Angels! People have been wondering what the Ghost Dance will be like. Those who have seen the dance drew diametrically opposite conclusions from it. Some said it was a fantastic performance, yet others claim it was a nightmare. Now, you've got a chance to verify it by yourself! The mystery hero from the east, who can greatly increase all party members' DEF, Dodge and END, will show up in CS Resource Tycoon! And good news is that, the TOP SIX winners in the overall ranking will all be able to take the hero into their squad! Plus, you will be able to win awesome rewards by reaching certain devotion and consuming resources! From Mar. 21st to Mar. 26th(server time), you can gain points by collecting required resources during the event, , i.e. Enchanted Ore, Spring of Wisdom, Spirit Essence, Magic Mount Soul, Ascension Stone, Runestone, Awakening Stone, Element Crystal, Angel Tears, Aegis Shard, Blessed Stone, Soulstone, Gem Enhancement Stone, Gems and Grotto Heart. If you already have Soul Rapier, Crooked Claw or Ghost Dancer in your party, you can exchange them for various heroes and EXCLUSIVE amulets! Check the Tycoon Mystic Deal in Hot Events from Mar. 21st to Mar. 28th(server time)! The 21st CS Team Tournament will start on Mar. 23rd(server time)! Team up with your friends and fight for glory! In addition, if you want to gain more resources for the tycoon, don't forget to check out Lucky Tree, Lucky Tree, Djinni's Merchant and Navigation King. Join League of Angels today and enjoy the award-winning MMORPG absolutely free!